LEAD NICKEL & CADMIUM FREE!! Lead & Nickel Free!! Gold Tone 2 Pair Set Includes A Pair Of Small Faux Pearl Bead Studs And A Pair Of Pink Hearts. They Are Very Cute And Small. 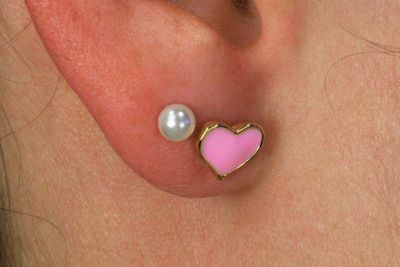 Faux Pearl Earrings Measure: 4mm.